Mekkora volt a jövedelemkülönbség Európa és Ázsia között? The debate over how the real income gaps between countries have evolved over the centuries has heated up since the 1990s. This column argues for a reshuffling of the global ranks between Columbus and WWI. 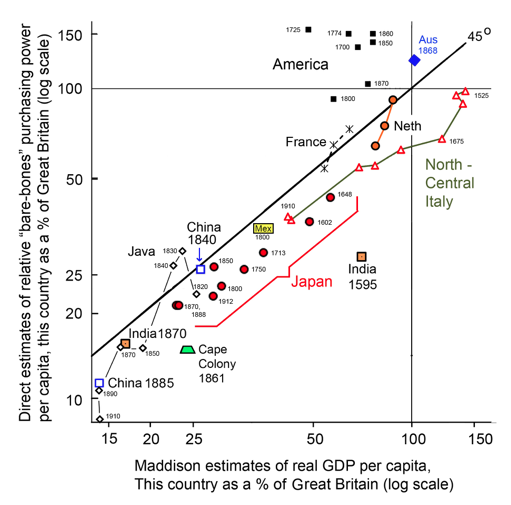 Findings include that (i) the real income gap between northwest Europe and the major Asian countries was greater since the 1500s than previously estimated; (ii) contrary to all previous estimates, Mughal India around 1600 was already far behind both Japan and Northwest Europe; and (iii) average incomes in North America were already higher than in Britain or France in the late 17th century, long before Maddison’s suggested catching-up date for the US versus Britain of around 1900.